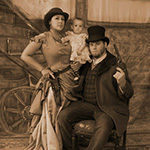 Located in Columbia State Historic Park, Kamice’s Photographic Establishment provides a unique experience to travel back in time by dressing up in nineteenth-century costumes and having an old-time photo made for a memorable keepsake that will last a lifetime. We have a large selection of costumes and props for almost any kind of persona including outlaws, saloon girls, cowboys and cowgirls, miners, victorian ladies and gentlemen, and more! We can accommodate infants to adults, and groups up to forty people (please call ahead to schedule an appointment). Several print sizes and photo packages are available.